We want you to be satisfied with your purchase. We will replace, refund or issue credit on merchandise returned in unused condition. LittleMachineShop.com warrants that for a period of 90 days from the date of shipping, merchandise shall be free from defects in materials and workmanship under normal use provided such merchandise is correctly installed and maintained. This warranty shall not apply to products that have been subject to misuse, abuse, neglect or improper storage, handling or maintenance. Return defective merchandise pre-paid to LittleMachineShop.com. The product, or parts thereof, will be repaired or replaced (at our option) and shipped back to you free of charge. Machines sold by LittleMachineShop.com are warranted for one year from the date of shipment. Contact LittleMachineShop.com (info@littlemachineshop.com) during the warranty period to arrange for any necessary parts for your machine. A machine is an electrically powered device with a motor and its own power cord. This warranty covers the replacement of, but not the installation of, any machine parts that fail during the warranty period. You must return the defective part to LittleMachineShop.com with inbound shipping costs prepaid. Machine parts found to be defective in material or workmanship during the warranty period will be replaced or repaired (at the sole discretion of LittleMachineShop.com) and shipped back to you free of charge. Any parts that are modified, altered, misused, abused, or neglected void the warranty. You are responsible for all expenses associated with non-warranty repairs. This warranty does not cover normal wear and consumable parts such as (but not limited to) belts, filters, lubricants, batteries, lamps, brakes, blades, and cutting tools. You are responsible for providing correct power to operate all electrical equipment associated with your purchase. 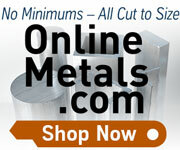 LittleMachineShop.com sells machines from other manufacturers. Where the manufacturer offers a warranty, that warranty supersedes and replaces this warranty. Machines that are not in the United States or Canada are covered by our Machine Warranty except that we will not pay for shipping for replacement parts or for any other reason. We specifically do not cover shipping damage. Place a claim with your carrier for damage that occurs during shipment. Buyers exclusive remedy for breach of this warranty shall be the replacement or repair (at our option) of any defective merchandise returned to LittleMachineShop.com within the warranty period. In no event shall LittleMachineShop.com be liable for any incidental or consequential damages or for loss of profits or for any other damages not withstanding that LittleMachineShop.com may have been advised that such damage may be likely to occur. The foregoing is the LittleMachineShop.com's exclusive warranty and is in lieu of all other warranties, express or implied, including warranties of merchantability or fitness for any purpose. LittleMachineShop.com shall not be liable to buyer on any claim of negligence or for any manufacturer's strict liability on any merchandise. No one is authorized by LittleMachineShop.com to change the forgoing provisions or assume any obligations or liabilities for LittleMachineShop.com.